Using the Event Horizon Telescope, scientists obtained an image of the black hole at the center of galaxy M87, outlined by emission from hot gas swirling around it. A large consortium of astronomers released the first image of a black hole on April 10. It is a supermassive black hole at the center of the giant elliptical galaxy M87. How did they do it? Isn’t that impossible? The Event Horizon Telescope (EHT) project linked together radio telescopes around the globe using a technique called Very Long Baseline Interferometry (VLBI). Translated, that means astronomers linked multiple telescopes, in effect creating one giant telescope the size of the Earth! Astronomers have employed VLBI for years. The EHT effort has improved it, though, to the point where they have now achieved this impressive result. The EHT team collected data in 2017 on the black hole at the center of M87 and also in 2018 on the one at the center of our Milky Way galaxy. We are only 26,000 light-years from the supermassive black hole in our galaxy, but M87 is some 53.5 million light-years away. The black hole in M87 was already known to have a mass of about 6.5 billion Suns, while the one in our galaxy weighs in at just over 4 million Suns. 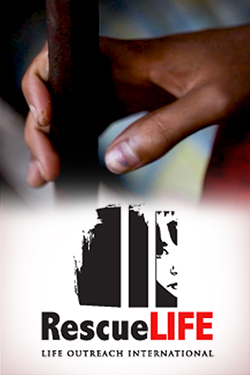 The first data set took two years to process due to the enormous amount of data collected and also its complexity. Expect the image of the second black hole to be released in the near future. 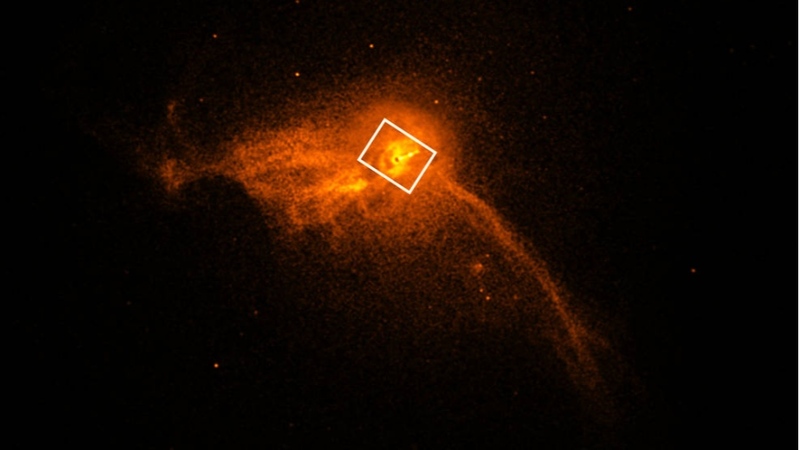 This image from the Chandra X-ray Observatory shows the black hole at the core of the M87 galaxy. But, wait a minute. Isn’t it impossible to snap a picture of a black hole? A black hole is, well, black! Indeed, a black hole is defined as an object from which not even light can escape. 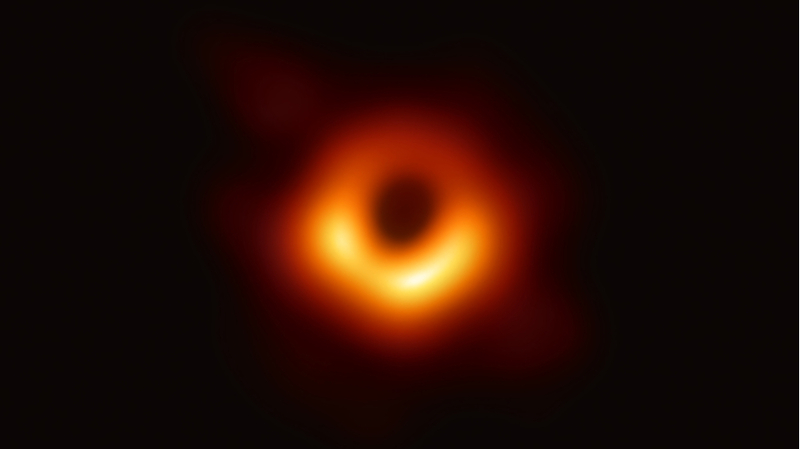 The image that the EHT team produced is not actually a picture of a black hole, even though it does appear to have a “black hole” at the center of a bright disk. What it does show is a kind of shadow or silhouette produced by the black hole as well as material swirling around it. The dark spot you see is larger than the actual black hole. Are there any broader implications of this discovery? Indeed there are. Not only do these observations give us a new way to observe black holes, they also give us new ways to test general relativity. Albert Einstein introduced general relativity in 1916 to replace Isaac Newton’s theory of gravity. General relativity is a completely different conceptualization of gravity. In general relativity massive bodies warp the space around them, causing even light to follow curved paths through space. Arthur Eddington first confirmed these radical predictions a century ago (100 year anniversary on May 29) with observations of a total solar eclipse.